The important role played by organisms in the world-wide economy needs to be better understood if resources of all kinds are to be used responsibly and to the best effect. The Biology of World Resources is an international research series that examines the influence of living organisms (both micro and macro) on the world's manufactured and natural resources. 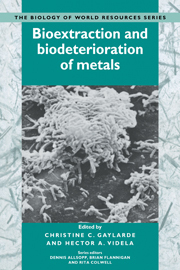 Initial volumes in the series cover biodeterioration of materials; biodegradation of wastes and their bioconversion into less harmful or more useful products; biological extraction and concentration of materials; and the broader problems presented by composite structures and systems and natural environments utilized for production or environmental purposes.